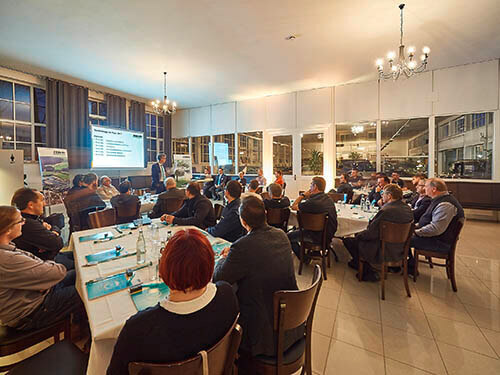 When it comes to hot topics such as lightweight construction and Industry 4.0, Arburg states: “Wir sind da.” – with its “Technology on Tour” roadshow. It includes 15 exclusive events for customers in the various regions and is currently touring Germany. The overwhelmingly positive response by participants shows that Arburg once again has its finger on the pulse of the times with this series of events. The extremely successful “Technology on Tour” event’s first stop was Heilbronn in September 2017, the final event will take place in Munich in July 2018. True to the company’s “Wir sind da.” brand promise, Arburg seeks proximity to its customers and personal dialogue, despite the general trend towards digital communication. “With this exclusive series of events we are able to inform around 50 customers at each time directly and locally about trends in plastics processing – from Hamburg to Radolfzell and from Dresden to Radevormwald,” explains Oliver Giesen, Sales Director for Germany. “Demand is high and the participants of the first five events held so far were absolutely delighted.” It is therefore a very realistic option to take the roadshow to an international level in the coming years. Customers praised the healthy mix of expert presentations, the live experience and get-together in a suitable setting as well as the start time of the event in the late afternoon which makes attendance possible outside business hours. The topics also met with approval. “I have gained a good overview of Industry 4.0 and lightweight construction and have learned how Arburg and the other attendees view and handle these issues,” was the positive conclusion drawn by Klaus Dieter Schell, Technical Director at Heinlein Plastik-Technik from Ansbach. Max Strauß, Director of 1st Mould based in Pirna, was also pleased with the event and the exclusive setting. He suggested adding practical product demonstrations to the program in addition to the presentations. Christian Mirtschin, Technical Manager Factory 2 for Bergi-Plast GmbH in Dohma, added: “We were particularly interested in what Arburg offers its customers regarding Industry 4.0 and how we will be supported in this respect. I particularly appreciate Arburg’s customer focus and reliability.” Mr. Mirtschin added that Technology on Tour provided him with valuable ideas and suggestions to further develop his own concept for production digitalisation. “The compact presentations offer a first overview of the key topics, the details can be looked at in more depth later,” said Oliver Giesen. One presentation, for example, introduces the ProFoam and Mucell lightweight construction processes as well as fibre direct compounding. If a customer takes a greater interest in one of these topics, the Arburg experts can give individual advice in the next step. In the Customer Center at the company headquarters in Lossburg, Allrounder injection moulding machines equipped with the specific customer parts can then be used to test which lightweight construction process is best suited to the particular application. The presentation on Industry 4.0 examines the digitalisation of production and innovative solutions. Among other items, it outlines new possibilities for added value by means of efficient production of small-volume batches and customer-specific one-off parts, requirements concerning the smart machine, smart production and smart services in the smart factory as well as the analysis of the gathered complex data and functions of assistance systems.